This article is about the locality within the postcodes 3000 and 3004 of Melbourne in Victoria, Australia, officially known as "Melbourne". For the Greater Melbourne metropolitan area, see Melbourne. For the local government area that envelopes the locality, as well as some inner suburbs, see City of Melbourne. Melbourne City Centre (also known colloquially as simply "The City" or "The CBD") is an area of Melbourne, Victoria, Australia. It is the area in which Melbourne was established in 1835, by John Batman and John Pascoe Fawkner, and its boundaries are defined by the Government of Victoria's Melbourne Planning Scheme. 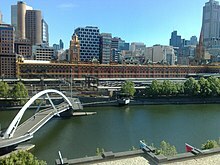 Today it comprises the two oldest areas of Melbourne; the Hoddle Grid and Queen Victoria Market, as well as sections of the redeveloped areas of Docklands and Southbank/South Wharf. 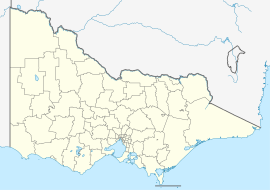 It is not to be confused with the larger local government area of the City of Melbourne. In April 1835, John Batman, a prominent grazier and a member of the Geelong and Dutigalla Association (later Port Phillip Association), sailed from Launceston on the island of Van Diemen's Land (now the State of Tasmania), aboard the schooner Rebecca, in search of fresh grazing land in the south-east of the Colony of New South Wales (the mainland Australian continent). He sailed across Bass Strait, into the bay of Port Phillip, and arrived at the mouth of the Yarra River in May. After exploring the surrounding area, he met with the elders of the indigenous Aboriginal group, the Wurundjeri of the Kulin nation alliance, and negotiated a transaction for 600,000 acres (2,400 km²; 940 mi²) which later became known as Batman's Treaty. The transaction, which is believed to have taken place on the bank of Merri Creek (near the modern day suburb of Northcote), consisted of an offering of: blankets, knives, mirrors, sugar, and other such items; to be also tributed annually to the Wurundjeri. The last sentence of Batman's journal entry on this day became famous as the founding charter of the settlement. So the boat went up the large river. And, I am glad to state about six miles up found the river all good water and very deep. This will be the place for a village. — Journal of John Batman (8 June 1835). Upon returning to Van Diemen's Land, Batman's treaty was deemed invalid by the Governor of New South Wales, Sir Richard Bourke, under the Proclamation of Governor Bourke in August 1835. It was the belief of Governor Bourke, as well as the Governor of Van Diemen's Land, Sir George Arthur, that the Aboriginal people did not have any official claims to the lands of the Australian continent. The proclamation formally declared, under the doctrine of terra nullius, that The Crown owned the whole of the Australian continent and that only it alone could sell and distribute land. It therefore voided any contracts or treaties made without the consent of the government, and declared any person attempting to rely on such a treaty to be trespassing. However, at the time the proclamation was being drawn up, a prominent businessman from Van Diemen's Land, John Pascoe Fawkner, had also funded an expedition to the area; which sailed from George Town aboard the schooner Enterprize. At the same time, the Port Phillip Association had also funded a second expedition; which sailed from Launceston aboard the Rebecca. The settlement party aboard the Enterprize entered the Yarra River, and anchored close to the site chosen by Batman, on 29 August. The party went ashore the following day (near what is today William Street; and is now celebrated as Melbourne Day) and landed their stores, livestock and began to construct the settlement. The Association party aboard the Rebecca arrived in September after spending time at a temporary camp at Indented Head, where they encountered William Buckley – an escaped convict, believed dead, who had been living for 32 years with the indigenous Aboriginal group, the Wathaurong of the Kulin nation alliance. Batman was dismayed to discover the settlers of the Enterprize had established a settlement in the area and informed the settlers that they were trespassing on the Association's land. However, according to the Proclamation of Governor Bourke, both the parties were in fact trespassing on Crown land. When Fawkner (who was noted for his democratic nature) arrived in October, and following tense arguments between the two parties, negotiation were made for land to be shared equally. 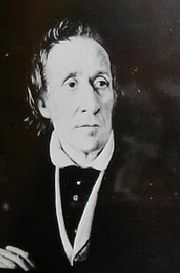 As Fawkner had arrived after the two parties, he was aware of the Proclamation of Governor Bourke, which had gained approval from the Colonial Office in October. He knew that cooperation would be vital if the settlement was to continue to exist fait accompli. Land was then divided, and the settlement existed peacefully, but without a formal system of governance. It was referred to by a number of names, including: "Batmania" and "Bearbrass" of which the latter was agreed upon by Batman and Fawkner. Fawkner assumed a leading role in the establishment of Bearbrass; which, by early 1836, consisted of 177 European settlers (142 male and 35 female settlers). The Secretary of State for the Colonies, Charles Grant, recognised the settlement's fait accompli that same year, and authorised Governor Bourke to transfer Bearbrass to a Crown settlement. Batman and the Port Phillip Association were compensated £7,000 for the land. And, in March 1837, it was officially renamed "Melbourne" by Governor Bourke in honour of the British Prime Minister of the day, William Lamb (the Lord Melbourne). The City Centre is bordered by Spencer Street to the west and extends north as far as Grattan Street which borders Carlton. The border extends along La Trobe Street, William Street, Peel Street, Grattan Street, taking in the Queen Victoria Market, Berkeley Street, Victoria Street. To the east it is bordered by Spring Street, however the area extends east to take in parts of Wellington Parade, Brunton Avenue, Punt Road and the Yarra River. It borders South Yarra to the south east at Anderson Street, Domain Road, Domain Street, Arnold Street, Fawkner Crematorium and Memorial Park, Commercial Road, High Street. It also borders both St Kilda along St Kilda Road and Albert Park along Queens Road, Lakeside Drive and South Melbourne along Albert Road, Kings Way, Palmerston Crescent, Wells Place and finally Southbank along St Kilda Road and the south side of Flinders Street (Northbank) which includes Flinders Street station and the Melbourne Aquarium. Although these are the borders on official maps, there are several adjoining areas that function as part of the Central Activities District. This includes Docklands (with Docklands Stadium), Southbank, South Wharf and East Melbourne/Jolimont (with the Melbourne Cricket Ground). Despite the area being described as the centre, it is neither the geographic or demographic centre of Melbourne, due to an urban sprawl to the south east; the geographic centre is currently[when?] located at Bourne Street, Glen Iris. Aerial of the southern area of Melbourne's CBD. The far right of the image is Flinders Street station and the Yarra River. The Hoddle Grid is the layout of the streets in the centre of the original Melbourne City Centre. The grid was laid out in 1837 by Robert Hoddle. All major streets are one and half chains (99 ft or 30 m) in width, while all blocks are exactly 10 chains square (10 acres, 201 m × 201 m). It is one mile (1.6 km) long by half a mile wide (0.80 km). The grid's longest axis is oriented 70 degrees clockwise from true north, to align better with the course of the Yarra River. The majority of Melbourne is oriented at 8 degrees clockwise from true north–noting that magnetic north was 8° 3' E in 1900, increasing to 11° 42' E in 2009. It covers the area from Flinders Street to Queen Victoria Market, and from Spencer Street to Spring Street. From the 1870s to 1920s, the central part of Melbourne was home to mostly medical professionals who had established practices along Collins Street and Spring Street. Before the 1960s, only a handful of permanent residents lived in the Spring Street area and St Kilda Road. The area was largely unpopular for residents and Council policies did not permit development of apartment style housing in the area. St Kilda Road was annexed in the 1960s and given the postcode of Melbourne 3004 to stimulate office development along the strip and reduce pressure on overdevelopment of the Hoddle Grid. The result was the demolition of many of the street's grand mansions. During Melbourne's colonial formation, no space in the city was given to public squares or piazzas, as was common in European and North American cities, because colonial planning in Australia was designed to avoid any facilitation of protests or public loitering. Furthermore, in the 20th century, the majority of Melbourne's inhabitants would commute into the CBD purely for work purposes, and thus little time was spent in the city recreationally. In the 1970s, one commentator remarked that Little Lonsdale Street was "as deserted as war-torn Berlin”. Public planning policy shifted in the 1980s and interest in the CBD was renewed. In the 2000s and the 2010s, inner-city living has increased, attracting international investors particularly those from China. Central Melbourne has one of the fastest growing residential populations in Australia. Residents of the city centre are of mixed social status. On one hand, living in the centre of the city offers proximity to work and the best access to public transport. On the other hand, there are many strata titled studio apartments that have no carparks and limited space. As a result, there is a mix of students and young urban professionals living in the locality of Melbourne, with a relatively low car dependency. The City Centre is the core central activities district (CAD) of Melbourne's inner suburbs. It encompasses a number of places of significance, which include the Australian Centre for the Moving Image, Crown Casino, Federation Square, Flinders Street railway station, Melbourne Aquarium, Melbourne Convention & Exhibition Centre, Melbourne Town Hall, National Gallery of Victoria, Arts Centre Melbourne, State Library of Victoria, State Parliament of Victoria and Supreme Court of Victoria. Bordering its north-east perimeter is the World Heritage-listed Royal Exhibition Building and Carlton Gardens as well as the Melbourne Museum. It is also the main terminus for the Melbourne metropolitan and Victorian regional passenger rail networks–being Flinders Street and Southern Cross stations respectively, as well as the most dense section of the Melbourne tram network. 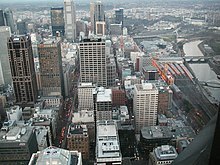 The City Centre is the major central business district (CBD) of Greater Melbourne's metropolitan area, and a major financial centre in Australia and the Asia-Pacific region. It is home to the corporate headquarters of the World's two largest mining companies: BHP and Rio Tinto Group; as well as two of Australia's "big four" banks: ANZ and the National Australia Bank, its two largest gaming companies: Crown and Tabcorp, largest telecommunications company Telstra, two largest transport management companies: Toll and Transurban and the iconic brewing company Foster's Group. It also serves as the main administrative centre for the City of Melbourne as well as the State Government of Victoria – the latter with the suburb of East Melbourne. Three universities have major campuses in the area: Three campuses for Victoria University (City King, Queen, Flinders campuses) in Center, One campus for the RMIT University (city campus) in Northern and the University of Melbourne (Victorian College of the Arts) in Southern. 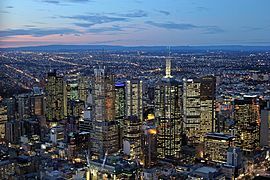 Melbourne City Centre, compared with other Australian cities, has comparatively unrestricted height limits and as a result of waves of post-war development contains five of the six tallest buildings in Australia, the tallest of which is the Eureka Tower, situated in Southbank. It has an observation deck near the top from where you can see above all of Melbourne's structures. The Rialto tower, the city's second tallest, remains the tallest building in the old CBD; its observation deck for visitors closed in December 2009. Aerial view of the Melbourne Cricket Ground (MCG), located at Melbourne Park, which also houses Rod Laver Arena and the Hisense Arena (sports & entertainment). 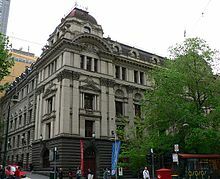 Notable theatres and performance venues in the City Centre include Arts Centre Melbourne (which includes the State Theatre, Hamer Hall, the Playhouse and the Fairfax Studio), Melbourne Recital Centre, Sidney Myer Music Bowl, Princess Theatre, Regent Theatre, Forum Theatre, Palace Theatre, Comedy Theatre, Athenaeum Theatre, Her Majesty's Theatre, Capitol Theatre, Palais Theatre and the Australian Centre for Contemporary Art. It is also the literary centre of Australia, and has more bookshops and publishing companies per capita than any other city in Australia, and includes the headquarters of the World's largest travel guidebook publisher Lonely Planet. In 2008, it was designated a "City of Literature" by UNESCO in its Creative Cities Network. Melbourne has been placed alongside New York and Berlin as one of the world's great street art meccas, and its extensive street art-laden laneways, alleys and arcades were voted by Lonely Planet readers as Australia's top cultural attraction. Most professional sporting clubs represent Greater Melbourne (e.g. Melbourne Victory, Melbourne Storm). An exception is the Melbourne Cricket Club and Melbourne Football Club (its offshoot), both based at the Melbourne Cricket Ground which was built in Jolimont, adjacent to the city but a locality of the suburb of East Melbourne. Both were the first clubs of their respective sports and established in a time when the city's population was still very small and limited to a handful of inner suburbs. As a result, the Melbourne Cricket Club has a fairly exclusive membership, whilst the Melbourne Football Club, although bearing the name Melbourne, is associated by the supporters of other suburban clubs as representing the central suburb and perceive its supporters to represent the locality and not the entire city. As a result, despite its rich tradition and early success, it is one of the least supported clubs in the VFL/AFL. The lack of identity resulted in a push for the Melbourne Hawks, which was stopped by intervention from Joseph Gutnick and the majority of the Hawthorn Football Club members. It has had intense rivalries with younger clubs from the adjacent inner suburbs such as the Collingwood Football Club and early inter-town rival Geelong Football Club. The Melbourne Football Club has recently made efforts to shed its suburban tag and be embraced by the whole metropolitan area. In line with this, the club recently employed strategies such as establishing Team Melbourne, (a group of sporting teams which bear the name "Melbourne"), and a strategy for promoting the brand as representing the city in China through club supporter and former Lord Mayor John So. Golf is played at the course of the Albert Park Golf Club on Queens Road. The City Centre has hosted a number of events of significance, which include: the 1901 inauguration of the Government of Australia, 1956 Summer Olympic Games, 1981 Commonwealth Heads of Government Meeting, 1995 World Police and Fire Games, 2000 World Economic Forum, 2006 Commonwealth Games, 2015 Cricket World Cup and G20 Ministerial Meeting – among others. It is also recognised for the substantial number of cultural and sports events and festivals it holds annually – many being the largest in Australia and the World. The Melbourne City Centre is the transport hub of the city. The city is serviced by five railway stations as part of the Melbourne Underground Rail Loop: Flinders Street station, which is the hub for Melbourne's suburban train network and the busiest station, Southern Cross station, which is the hub for regional and interstate transit located on Spencer Street, and three underground stations–Parliament, Melbourne Central and Flagstaff stations. Trams run down the main streets of Flinders, Collins, Bourke and La Trobe as well as Spencer, Market, Elizabeth, Swanston, Spring and Swan Streets and St Kilda Road. There are several large accessibility tram "superstops" located in Flinders Street, Collins Street, Swanston Street and Bourke Street Mall. The city is also well connected by bus services, with majority of buses running down Lonsdale Street. Major bus stops include Melbourne Central and Queen Victoria Village. Most bus routes service suburbs north and east of the city given the lack of train lines to these areas. Major bicycle trails lead to the CBD and a main bicycle path down Swanston Street. Ferries dock along the northbank of the Yarra at Federation Wharf and the turning basin at the Aquatic Centre. There is also a water taxi service to Melbourne and Olympic Parks. ^ a b Australian Bureau of Statistics (27 June 2017). "Melbourne (State Suburb)". 2016 Census QuickStats. Retrieved 30 June 2017. ^ Richards, Tim. "It's rooted: Aussie terms that foreigners just won't get". Traveller. Retrieved 11 January 2017. ^ a b c d Serle, Percival (1949). "Batman, John". Dictionary of Australian Biography. Sydney: Angus and Robertson. Retrieved 25 September 2009. ^ "Port Phillip Association" (Web). Encyclopædia Britannica. 2009. Retrieved 25 September 2009. ^ a b c "Journal of John Batman". State Library of Victoria. Archived from the original (Web) on 21 September 2009. Retrieved 25 September 2009. ^ a b "The Deed". Batmania. National Museum of Australia. Archived from the original (Web) on 26 July 2008. Retrieved 25 September 2009. ^ Ellender, Isabel; Christiansen, Peter (2001). People of the Merri Merri. The Wurundjeri in Colonial Days. Melbourne: Merri Creek Management Committee. ISBN 0-9577728-0-7. ^ a b c d Serle, Percival (1949). "Fawkner, John Pascoe". Dictionary of Australian Biography. Sydney: Angus and Robertson. Retrieved 25 September 2009. ^ a b c d e "Foundation of the Settlement" (PDF). History of the City of Melbourne. City of Melbourne. 1997. pp. 8–10. Archived from the original (PDF) on 22 September 2009. Retrieved 25 September 2009. ^ Morgan, John (1852). The Life and Times of William Buckley (Web). Hobart: Archibald MacDougall. p. 116. Retrieved 25 September 2009. ^ a b Reed, Alexander Wyclif (1973). Place names of Australia. Sydney: Reed. p. 149. ISBN 0-589-50128-3. ^ a b "Australians don't loiter in public space – the legacy of colonial control by design". The Conversation. 19 May 2017. Retrieved 19 May 2017. ^ "Rare house in Melbourne's CBD to return to its commercial roots". Commercial Real Estate. 16 March 2017. Retrieved 19 May 2017. ^ Dobbin, Marika (8 October 2009). "End in view for Rialto's top deck". The Age. Melbourne. Archived from the original on 16 January 2010. Retrieved 8 February 2010. ^ Allen, Jessica. The World’s Best Cities for Viewing Street Art, International Business Times (2010). Retrieved 16 October 2010. ^ "Research and statistics". Public Transport Victoria. 2013–2014. Archived from the original on 23 May 2016. Retrieved 23 May 2016. ^ "Accessible trams". Public Transport Victoria. Retrieved 23 May 2016. ^ "International connections". City of Melbourne. Retrieved 29 July 2016. ^ "City of Melbourne — International relations — Sister cities". City of Melbourne. Archived from the original on 26 September 2008. Retrieved 4 April 2008. ^ "Melbourne and Boston: Sister Cities Association". Melbourne-Boston.org. Retrieved 18 February 2015. ^ "The World Today – Melbourne makes Milan sister city". ABC Australia. 22 July 2003. Retrieved 18 February 2015. Wikivoyage has a travel guide for Melbourne/City Centre.